I’m by no means a professional photographer, but the lessons I’ve learned over the last few months will be useful to anyone looking to improve his or her underwater photography. For the bulk of my 17 years as a diver, I didn’t pay much heed to underwater photography and in fact felt that it would detract from my love of being underwater — how wrong I was. My first “wow” moment came in Lembeh Strait when I signed up for a photography course and rented my first serious camera set-up. 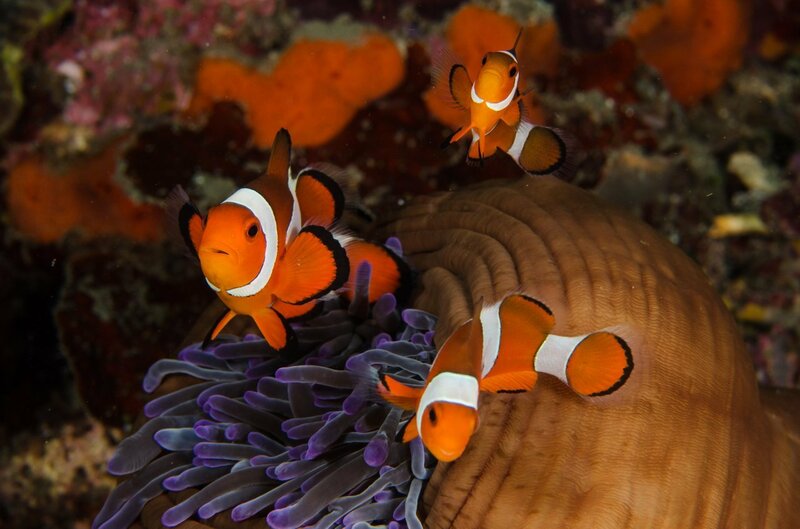 The potential to capture crisp, artistic shots of marine life, in the muck-diving capital of the world, was addictive. Now living St. Lucia, and with the same rig I used in Indonesia, I’ve taken every available opportunity to dive with my camera and practice. I’m by no means a professional photographer, but the lessons I’ve learned over the last few months will be useful to anyone looking to improve his or her underwater photography. If you’re looking to create impactful images then there’s not much point in taking a camera underwater until you’re comfortable in the environment. Fine-tune your buoyancy, trim and finning techniques until they become second nature. PADI’s Peak Performance Buoyancy course is a good way to achieve this. Practice makes perfect and you don’t want your diving skills to negatively impact either your shots or the underwater world. We spend most of our time when scuba diving looking straight ahead or down at the reef below us. This perspective does not make for engaging photos. From now on, whenever shooting a subject, try to get below it or at the very least at the same level. You will find that your photos are immediately much more visually pleasing. Water quickly absorbs color, making the reef look mostly blue and green to both our eyes and the viewfinder. One of the incredible things about photography is that it brings out the true colors of marine life and displays the underwater world in all its glory. If you want to take high-quality photos then you must bring back the light and color to the reef. Usually this is best achieved by adding an external strobe to your camera set-up. Start with one and get comfortable using it before adding a second. If you plan on shooting mostly macro subjects then one strobe is usually all you’ll need. By shooting in automatic mode you are handing the creative power to your camera. This can be particularly ineffective underwater, where we can play with aperture, shutter speed and our strobes to create interesting effects in a challenging environment. Read up on aperture and shutter speed and start practicing shooting in manual mode on land. It can seem intimidating at first, but as you get the hang of it you’ll find it becomes a fun game. Your use of light and depth of field will determine the look of your photos. One of the first and most satisfying techniques I learned was to shoot subjects with water as the background. If you use a fast shutter speed (i.e. 1/250 sec) and a narrow aperture of f/16 or f/22 this will create a clean, black background that looks very professional and really brings out the subject. In both artwork and photography, certain patterns and compositions are more pleasing to the eye than others; becoming aware of these guidelines is critical to creating impressive underwater shots. One of the most celebrated is the “Rule of Thirds,” whereby the main point of interest in your image should be placed slightly off center. In terms of the main point of interest, remember that we are naturally drawn to the eye and then to the mouth of the subject. Paul Colley’s Winning Images With Any Underwater Camera provides an in-depth look at composition for those who want to study up. The vast majority of things you see underwaterwill not make for ideal photography subjects, not because they areuninteresting, but because they are relatively inaccessible or poorly positionedin terms of potential composition. When you first start shooting underwateryour passion and excitement will probably lead to you take many photos of lotsof subjects. With this strategy, though, you’ll be lucky to come away with asingle powerful image. Once you’ve got the hang of your camera, force yourselfto be selective and patient when looking for subjects. Ask yourself four questionsbefore starting to shoot: – Is the subject interesting?- Will its behavior allow me to photograph it, i.e. will it stay still?- Will the background be pleasing to the eye?- Is it accessible to me without damaging the environment? If you’re trying to create photos as art rather than just capturing memories, then it’s better to spend a long time with one great subject than a little time with lots of subjects. As you spend more time with subjects you will also find that they become more comfortable in your company and eventually may reward you with fascinating behavior. You should aim to make your photo, as shot, as “perfect” as possible. That said, keen photographers all use editing software such as Adobe Lightroom, Adobe Photoshop and Aperture to bring out the best in their images. It’s not cheating; it’s part of the process. Editing should become part of your routine workflow when going through your images. If using this software seems daunting, sign up for a course with a professional or buy an online course. There are some incredible underwater photographers out there and many of them generously share their expertise in the field. There are lots of online resources such as wetpixel.com, underwaterphotography.com and divephotoguide.com, along with this website. Martin Edge’s book The Underwater Photographer is considered the bible for this field and is an absolute must-have. It’s also a great idea to surround yourself with inspiration by reading underwater photography magazines, checking out the winning images from contests and filling your Facebook feed with photos from Scuba Diver Life, Underwater Macro Photographers, Wetpixel, etc. There is so much to learn when it comes to underwater photography, but hopefully these tips will set you on the right path. We hope you enjoyed this article and please share your useful pointers with us as well!